Tackle tough jobs efficiently and effectively with high-quality, reliable abrasive sanding discs and diamond cutting tools. These essential items are used across a variety of industries and trusted by professionals. This includes metalworkers, plumbers, plant contractors, and tank contractors, as well as foundry workers, vehicle repair experts, and vehicle body contractors. Our cut-off machines and properly paired abrasive discs are perfect for cutting and sanding most materials. Materials cut include cast iron, high-speed steel, plastics, PVCs, titanium, titanium alloys, tungsten carbide, stainless steels, traditional steels, and non-ferrous metals. In addition, these cut-off machines are highly effective with stones, rails, stone, masonry materials, and tiles, similar to our tile wet saws. 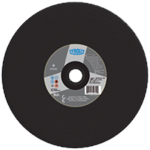 The abrasive discs we carry are available in a range of sizes. 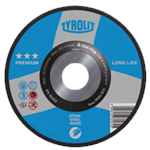 Simply select the appropriate disc for your cut-off machines, and add the number of units your shop needs. Note that the smaller sized discs come in a box of 25. The larger discs come in a box of 10. If you have any questions regarding your shop, machine, and disc requirements, call us toll free at (800) 582-1429. One of our customer service professionals will be happy to help.